Social anthropology is, in the classic definition, dedicated to the study of distant civilizations in their traditional and contemporary forms. But there is a larger aspiration: the comparative study of all human societies in the light of those challengingly unfamiliar beliefs and customs that expose our own ethnocentric limitations and put us in our place within the wider gamut of the world's civilizations. Thematically guided by social setting and cultural expression of identity, Social and Cultural Anthropology in Perspective is a dynamic and highly acclaimed introduction to the field of social anthropology, which also examines its links with cultural anthropology. A challenging new introduction critically surveys the latest trends, pointing to weaknesses as well as strengths.Presented in a clear, lively, and entertaining fashion, this volume offers a comprehensive and up-to-date guide to social anthropology for use by teachers and students. 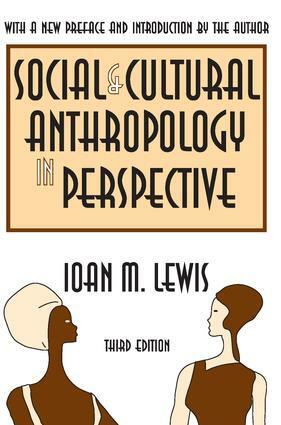 Skillfully weaving together theory and ethnographic data, author Ioan M. Lewis advocates an eclectic approach to anthropology. He combines the strengths of British structural-functionalism with the leading ideas of Marx, Freud, and Levi-Strauss while utilizing the methods of historians, political scientists, and psychologists. One of Lewis' particular concerns is to reveal how insights from ""traditional"" cultures illuminate what we take for granted in contemporary industrial and post-industrial society. He also shows how, in the pluralist world in which we live, those who study ""other"" cultures ultimately learn about themselves. Social anthropology is thus shown to be as relevant today as it has been in the past.